Thankfully, in the few months since then, those feelings of fright have calmed somewhat as our new little family has settled into a cozy (and exhausting) routine. To be honest, being a new dad is a lot harder than I ever imagined it would be. For one, babies eat a lot more frequently than I realized. (Where do they put it all? Oh – in their diapers. Great.) Also, I don’t know where the term “sleep like a baby” comes from because this baby sleeps at strange times of the day and night and seems to wake up at the drop of a single feather. Although being a parent isn’t for the faint of heart, I’m starting to pick up certain tricks to make things easier. I’ve learned how to swaddle our girl (for the uninitiated, that means taking a soft cloth and wrapping her up like a giant burrito – minus the guacamole and sour cream), how to hold her to relieve the pressure when her stomach gets gassy, and the exact sounds to make if I want to get her laugh (which she’s just started doing). One of the coolest things I’ve learned is how much she enjoys being close to my wife and I. It may be the warmth of our bodies or being able to hear our heartbeat, but it seems that laying against our chests puts her at ease and helps soothe her to sleep. While this sounds great in theory, carrying around a baby in one arm isn’t exactly conducive to getting much done during the day. While I do get to work from home, I still have to – well, you know – work. My wife needs to get things done, as well. 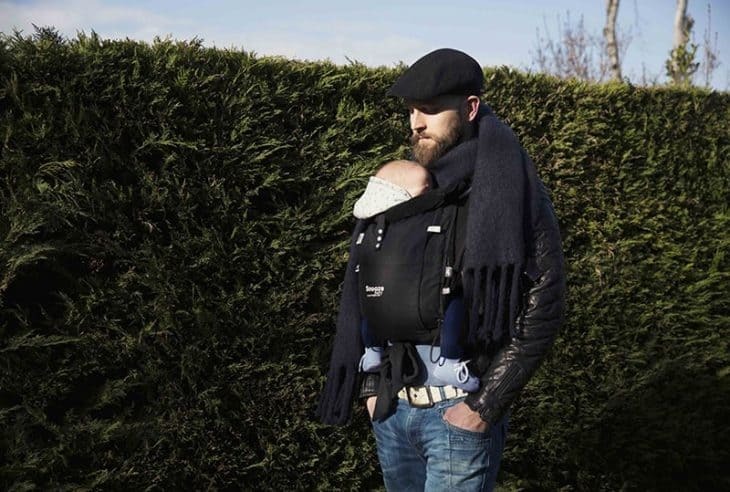 Enter the Kiss & Carry harness from Snooze Baby. This device has been a lifesaver for both of us. It’s easy to put on and wrap our daughter in securely. It holds her in an “M-position” where her knees are higher than her buttocks (I’ve learned that this is really important for babies of her size). Best of all, the inner holder wraps her in a comfy “cocoon” that keeps her incredibly snug. There’s a soft neck rest to ensure that her head is always properly supported. The outer layer of the harness connects quickly and easily for added security and support. The Kiss & Carry leaves our daughter wrapped in as though she’s swaddled against our chests. It’s perfect if we need her to get sleep, as well as to have her close so that we can interact with her as we work or do things around the house. I’ve discovered that the Kiss & Carry is much better than a baby stroller if we take her out for the day and need to use public transit or will be headed where there are lots of people. It has the added benefit of keeping her cozy and warm when we’re out on chilly days. The harness has truly been a lifesaver for this pair of newbie parents. It’s rugged, easy to clean, and we know it will last a long time. That’s good because it also converts for use as a back carrier when our daughter gets old enough to sit up by herself. We’ll be keeping her close for as long as possible as we all learn this parenting thing together!